A Starbucks Coffee To Go? How about a side of lizard with that? Home » Business » A Starbucks Coffee To Go? How about a side of lizard with that? One Starbucks drinker found a little surprise in her coffee this week. And no, it wasn’t the good kind. Kim Dillon, a resident of Phoenix was leisurely sipping on her venti sugar free latte when she felt something strange in her mouth. 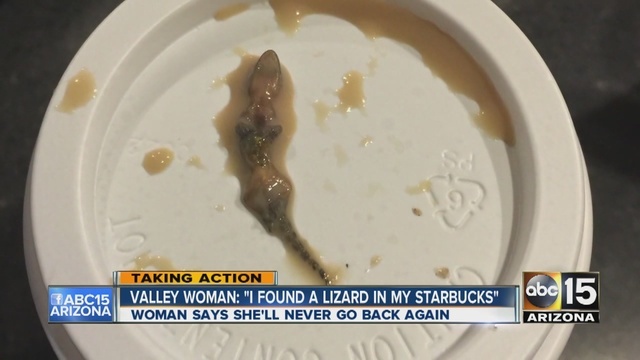 She quickly spit it out and was horrified to discover a tiny lizard had been brewed into her coffee. We will let you take a minute for the shudder that’s going down your spine right about now. The coffee giant has also released a statement that it’s “disturbed to learn about this” and plan on “looking into this immediately.” The grocery store which has the Starbucks store is checking with a pest control company, adding that this is an isolated event. Watch the video below. Needless to say, Kim has decided never to go back to Starbucks again. You might want to watch out for that morning Starbucks coffee!